2 town security members arrested over claims that Arabs attacking IDF were wounded, as they blocked search for potentially abducted kids. Judea and Samaria district police on Tuesday arrested two residents of the town of Itamar in Samaria who are members of the town's security team, on suspicion that they were involved in defending residents against an Arab riot in which rioters were supposedly wounded. The event took place two-and-a-half weeks ago on Shabbat, with the Arab rioters claiming they were wounded as they attacked an IDF force that the two security members were reportedly with. On Tuesday the two residents were arrested by the nationalist crime unit and brought to the Petah Tikva Magistrates Court, where they are to be represented by Attorney Adi Kedar of the Honenu legal aid organization. Of the two, one is a member of the community security team in Itamar, while the second is a member of the security team in Rekhes Gidonim. One of them, an outstanding soldier in an elite IDF unit, was arrested while serving in active reserve duty on his base. According to the reports, the incident began when Arab assailants stole a flock of sheep from Givat Alumot, located adjacent to Itamar. Members of the security team were called up together with IDF forces to locate the flock, which eventually they succeeded in doing. During the search a fear arose that Jewish children who were tending another flock may have been abducted, a wrinkle that led to additional forces being called up over the possibly life-threatening danger. 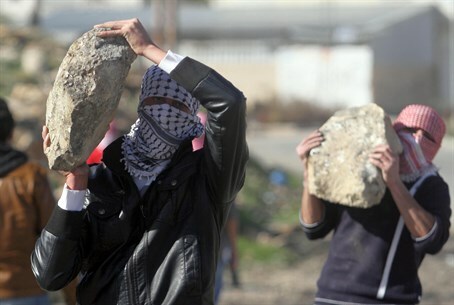 Numerous Arab rioters from the town of Akraba began hurling rocks at the forces as they searched for the stolen flock and potentially abducted children; Arab attackers who took part in the riot claimed that several were wounded by gunfire. Soon afterwards large IDF forces arrived to stave off the attacks by masses of Arab rioters, in clashes that continued for long hours. The members of the security squad returned to their towns after the flock was located and the possibility of an abduction was ruled out. "Scandal - security squad members have been abandoned"
"This is a scandal," Honenu said in a statement responding to the arrest. "Unfortunately the police again decided to arrest security squad members who bravely and effectively conducted their mission, instead of dealing with the Arab rioters." The statement added "we hope that the (security) system will wake up soon and that those arrested will be released." Deputy Samaria Regional Council Head Yossi Dagan responded to the incident as well, saying that he fully backs the security squad members and strongly condemns the arrests. "This scandalous arrest is an additional record that has been broken," said Dagan. "This is completely irrational management, and would not have happened in any other region in the country." "Members of the security squad defended the town and acted in a situation in which there was a fear that children were abducted," noted Dagan. "During their actions, they and IDF soldiers were attacked by dozens of Arab rioters from the town Akraba who came out against them and threw rocks and boulders at them, with the intention to wound and even kill, G-d forbid." Elaborating on the situation, Dagan said: "this was a security situation by all means, in which the (security) system was involved despite it still being Shabbat because of pikuah nefesh (the precept of saving a life superseding other Torah commandments - ed.)." "I don't even want to imagine what would have happened if the fears of children being abducted had actually occurred," added Dagan. "It cannot be that security squad volunteers are abandoned by the system like this." He emphasized that any person with a sound mind would be expected to back up the security squad members, "and the police should admit their mistake and release them immediately." Unfortunately the shocking arrest is far from the first of its kind; last week the town security coordinator in Beit Hagai, located south of Hevron in Judea, was arrested over suspicions of shooting at an Arab terrorist who tried to break into the town that Shabbat. Sources in the town report that Arab terrorists tried to breach into the community. The terrorists later claimed they were wounded by gunfire, and even though there was no evidence to support that claim the security coordinator was arrested. Likewise a Border Patrol officer is currently fighting a court case over charges that he shot an Arab rioter, who took part in violent Nakba Day riots that apparently sought to free terrorists from the Ofer Prison last May.